The Kailasanathar Temple is situated in the village of Thingalur, 18 kilometres from Kumbakonam. This is known to be sthalam for the presiding deity Chandran (Soma or moon), one of the navagrahas. However, the main deity in the temple is that of lord Shiva known here as Kailasanathar. Historical facts narrates the divine facts abouts Thingalur. 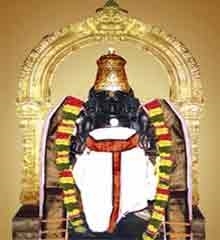 In the seventh century , Tamil poet-saint, one of the most prominent of the sixty-three nayanmars, Appar also known Thirunavukkarasar visted Thingalur. Thirunavukkarasar was surprised to see padasalas (schools), hospitals, travellers lodges, roads in that village were bearing his name. He came to know that the village headman called Apputhi adigal, a staunch devotee of Thirunavukkarasar, was behind these. Amazed at his devotion,he wanted to visit him. Apputhi adigal welcomed hime home and asked him to have lunch along with his disciples. Thirunavukkarasar accepted his invitation and said that he will be back after visiting the Kailasanathar temple. Chandran is said to be the grandson of Brahma, born to his son Athri and wife Anusuya. Puranas also says that Chandran was born out of 'paar kadal' while it was being churned for the 'amudham' (nectar of life). Datchan, one of his fathers in law cursed Chandran to lose his beauty and glamour as he was biased towards one of his wife Rohini, ignoring the rest of his twnty seven wives. He prayed to Lord Shiva and he restored his beauty saying that he will regain his figure slowly in a fortnight. But because of the curse he wanes every fifteen days. The waxing and waning of the Moon is due to this. As you enter the temple, in the left side you can see the snactum for Suryan. As you proceed towards south, you can see the sanctum of mother goddess Periyanayaki facing south. As you walk clockwise from there you can see ganapathy,Subramanya,Dakshinamurty, Gajalakshmi, Chandikeswarar and Bhairavar. In the sanctum sanctorum ,Lord Shiva here called Kailasanthar bless the devotees facing east. Close to that sannithi, we can see the sannithi for Chandran. praying to Chandran here will reduce the bad influence of Moon and the devotees are blessed and releived of their sufferings. People pray here for removal of obstacles in marriage proceedings, for child birth and excelling in education. Usually crowded during Pradoshams. Arudhra darshanam and Shiva rathri are celebertaed here in a grand scale. Ten days festival starting Chitra pournami ( Full moon day during mid May) is also very important and celeberated in a grand manner here. Chandra dosham ( influence of Moon) is said to cause ill health to their mother,mental imbalance and skin ailments. To absolve these, devotees offer white cloth and white flowers to Chandran.Offerings of white rice pudding, milk pudding, curd rice pleases Chandran. Temple location It is situated in the heart of the Thingalur village. Temple Timings It is normally open from 6 am –12.30pm and 4.00pm-8.30pm. Thingalur is around 18 kms from Kumbakonam off Thiruvayaru, Kumbakonam road. Plenty of buses from Kumbakonam, Tanjore and Thiruvayaru. Places nearbyThe other eight Navagraha temples are in proximity to Thingalur. Suriyanar Koil (for the planet Surya or Sun God), Kanjanoor (for the planet Venus or Sukran),Thirunallaru (for for the planet Saturn or Shani), Thiruvenkadu (for the planet Mercury or Budhan), Vaideeswaran koil (for the planet Mars or Sevvai), Thirunageswaram and Keezhperumpallam (for the two snake planets) and Alangudi (for the Guru) Mayavaram, Kumbakonam, Mannargudi are nearby.